For students who win the college admissions lottery and get in to the most selective universities, high income may not be a barrier to receiving financial aid. Here are some examples. 2011-12 School Year: About 240 families earning $180,000-200,00 received financial aid. Beginning with the Class of 2016, families with incomes between $65,000 and $150,000 will contribute from zero to ten percent of income, and those with incomes above $150,000 will be asked to pay proportionately more than 10%, based on their individual circumstances. Families at all income levels who have significant assets will continue to pay more than those in less fortunate circumstances. 2011-12 School Year: 99% of families earning $180,000-200,000 who applied for financial aid received grants that averaged $23,600. Applicants receive aid based on their families’ financial need. We do not use income cutoffs when determining whether to award aid. Any student whose family feels unable to afford the full cost of attendance is encouraged to apply for aid. 2011-12 School Year: 99% of families earning $150-200,00 who applied for financial aid were approved. Grants for those 505 families averaged $26,500 each. Families whose total gross income is less than $65,000 are not expected to make any financial contribution towards their child’s Yale education. 100% of the student’s total cost of attendance will be financed with a Yale Financial Aid Award. Families earning between $65,000 and $200,000 (with typical assets) annually contribute a percentage of their yearly income towards their child’s Yale education, on a sliding scale that begins at 1% just above $65,000 and moves toward 20% at the $200,000 level. There is no strict income cutoff for financial aid awards. Many families with over $200,000 in annual income receive need-based aid from Yale. 2012-13 School Year: 59% of families with incomes above $120,000 who applied received financial aid. 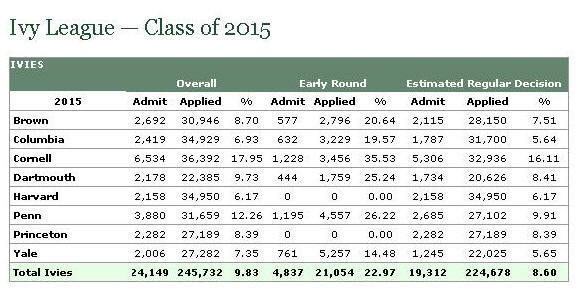 The average University of Chicago aid applicant receives $37,500 in scholarships each year. $160,000 income puts you in the top 10% of families in the United States. 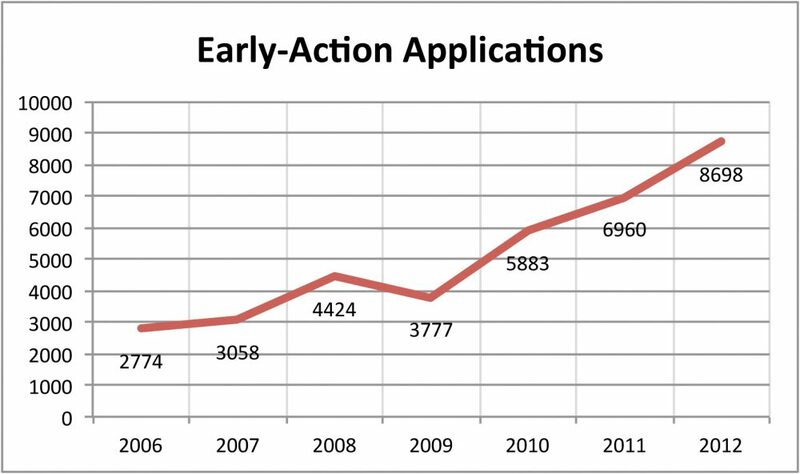 The number of college applications continues to increase and admission rates continue to decrease, with 2013 decisions leaving some students ‘a bit “baffled” and “dumbfounded”’. The New York Times recently reported 2013 acceptance rates for about 75 colleges. Why are so many good students denied admission? There are various reasons for this: Colleges concerned about their rankings are appearing more selective (and appealing) than ever. Admission officers often select students who are likely to enroll. And, of course, the huge volume of applications dictates that there just isn’t enough room for every good student who applies. Unexpected outcomes have reinforced the sometimes unpredictable nature of the “holistic”college application process. There are other reasons for the outcomes, all of which make holistic college admissions a complex, unpredictable process. So if you are a student or a parent who is scratching your head as you review the chart, just know that you’re not alone. Our student bloggers are a bit “baffled” and “dumbfounded” about the admission decisions, too. I’ll scream if I hear the word “holistic” at a college info session again…. Dan Edmonds argues that higher selectivity is a myth. What many parents and students don’t realize is that increasing numbers of applications isn’t necessarily a sign that it’s harder to get into a selective school; rather, it’s a sign of changes in behavior among high school seniors. More and more people who aren’t necessarily qualified are applying to top schools, inflating the application numbers while not seriously impacting admissions. In fact, it has arguably become easier to get into a selective school, though it may be harder to get into a particular selective school. This helps explain why students feel pressured to apply to so many schools, with the average student applying to more than nine colleges this past fall. Our high school guidance counselor keeps saying there is no need to panic. … there are more than 2,000 four-year colleges and universities in this country, and many of them offer an excellent education and admit the majority of students who apply. But as interest increases at selective institutions, it may help disappointed applicants to know that thousands of smart, talented, qualified students had to be turned away. When it comes to getting students into college (and prepared to succeed there), school counselors have a unique vantage point — seeing firsthand the factors that hinder their students from moving forward. A national survey of counselors, being released today by the College Board, finds that these counselors generally think their schools are not succeeding in the areas that the counselors believe are most important to promote student advancement. Meanwhile, high school teachers seem clueless about college readiness of their students. Total enrollment at American colleges and universities eligible for federal financial aid fell slightly in the fall of 2011 from the year before, according to preliminary data released Tuesday by the U.S. Education Department’s National Center for Education Statistics. The data from the department’s Integrated Postsecondary Education Data System show that 21,554,004 students were enrolled in fall 2011, down from 21,588,124 in fall 2010. While that drop is smaller than two-tenths of one percent, it is the first such dip since at least 1996, according to officials at NCES. In many ways the result is not surprising; college enrollments boomed in the late 2000s, as they often do during recessions, as workers lost jobs and sought to retool or opted to continue their educations because they didn’t like their prospects for employment. So it’s possible that enrollments are leveling off (and shrinking slightly) now because the economy had begun rebounding enough by fall 2011 that some of those who had flocked to higher education during the recession began finding jobs. It’s also possible that college tuition levels — which have continued to rise in recent years, driven in part by cutbacks in state support and other traditional sources of colleges’ revenue — are pricing more students out of higher education. Whatever the reasons, the data — if they persist — could pose a problem for the many policy makers and advocates seeking to increase higher education attainment. While many of those promoting the “completion agenda” are focusing on improving the performance of students who are already in college, they also strive to increase the level of college-going, particularly for those historically underrepresented in higher education. A furor erupted after University of Chicago professor Dario Maestripieri posted on Facebook about the lack of attractive female scientists at a recent conference. During my early years working in the oil fields, many of us laughed at this 1978 letter to Ann Landers from the wife of an oil geologist who wrote to complain about her husband having to train a new female scientist. My husband is a geologist for a major oil company. Recently he had to take a young woman geologist out to an oil well to train her. They were together constantly for three weeks, traveled thousands of miles alone in the car, ate all their meals together, even slept out on the rig. I’m not worried about the physical attraction, because most women geologists are so ugly they could go lion hunting with a switch…. 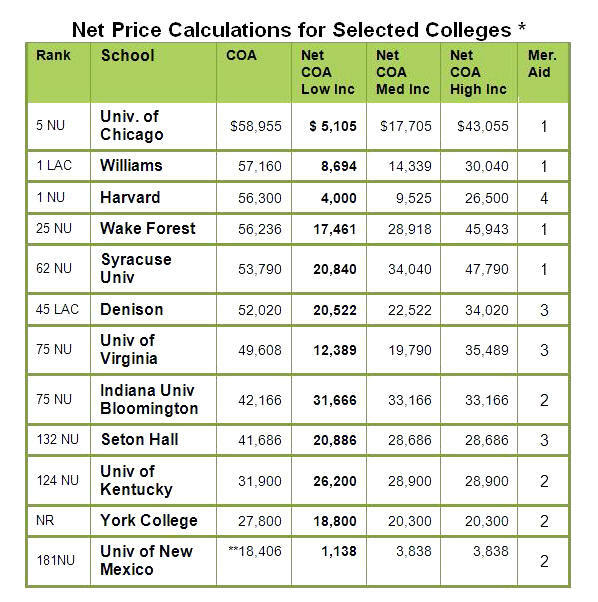 While all the top ten ranked universities offer generous need-based financial aid, only two – University of Chicago and Duke – award merit scholarships. First, here are the top ten universities as ranked by US News & World Report. The University also honors National Merit Finalists with a renewable award of $1,000 to $2,000. 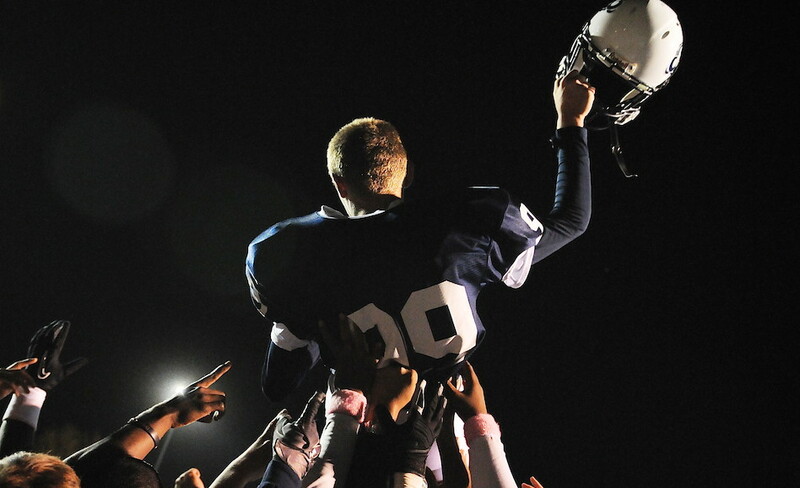 Do not underestimate the importance of sports as a hook for acceptance to highly selective colleges. The following quote is from a New York Times article about the Ivy League’s new policies that have substantially enhanced financial aid for all admitted students, making it easier to recruit elite athletes. A recruited Ivy League athlete must have the academic credentials to survive the stringent and highly selective admissions process at each institution. Coaches have little sway in the admissions process, although they do provide a list of potential athletes to admissions officials. Across the league, about 13 percent of each university’s incoming class is composed of athletes chosen from coaches’ lists. Essentially, coaches are selecting 13% of the class. Since most athletes are admitted in the early rounds of the process, the figures from this chart serve to make the significance of this hook even more compelling — 23% admit rate for the early rounds and 9% admit rate for regular decision. You need the other credentials, but playing football can be the hook that gets you in the door of that elite university. University of Chicago’s 25% increase continues an upward trend and may be one of the largest among all colleges this year. This continues a period of steady growth in the number of prospective College students of high ability who aspire to attend the University of Chicago…. Students who choose to apply early often view UChicago as their first choice, said James G. Nondorf, Vice President and Dean of Admissions and Financial Aid. Last year the College experienced similar growth in early applications, with an increase of 18.5 percent over the previous year. This year’s increase suggests that a growing number of highly accomplished students consider the College their leading option. Is it a “passion” for academic inquiry or is it a realization that an elite education can significantly increase their chances for future financial success? Starting October 29, all colleges are required to provide a Net Price Calculator (NPC) showing the ‘net price’ (defined as tuition, fees and indirect expenses minus grant and scholarship aid) for individual students based on their personal status. For more details you can go here. A low- to middle-income student enjoys a tremendous bargain at many top-ten schools, if he is admitted. With acceptance rates in the single digits for some of these schools, that’s a big “IF”. Quick comparisons can be made based on NPC results. For example, with similar COA figures, it appears that UVA offers more need-based aid for low-income students than Denison does. The detailed report generated as part of the NPC confirms this, indicating the next step might be a request for more detailed information from the college admissions staff. Merit scholarships may be the biggest unknown factor. I would be careful about relying on NPC figures for this, even for schools that explicitly state that they include merit in their calculations. Further research will usually be required. Bottom line: Families should run NPC reports for all schools on a student’s initial list as a useful first step in comparing affordability among the various options. ……….1 – NPC does not consider merit aid. ……….2 – NPC considers at least some merit aid. ……….3 – Unclear if merit aid is considered. ……….4 – School does not offer merit aid. ** This NPC non-resident COA is at odds with the information on the college website. According to the UNM website, it appears the NPC COA should be increased by approximately $13,000 a year. Since it’s unknown how that change would affect the net price, I would consider all these UNM numbers to be unreliable.